EconMatters does research, analysis, and writes articles devoted to the discussion of important economic and market specific issues relevant to our readers and global strategic investing. 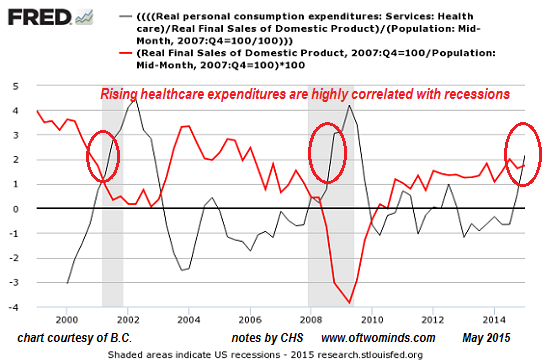 Three charts crystallize the healthcare dynamics that are dooming the U.S. economy. 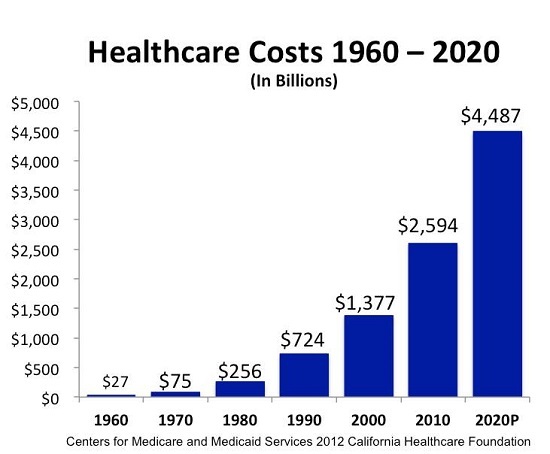 The first depicts the runaway growth of healthcare costs–a rapid expansion that is a permanent feature of U.S. healthcare, regardless of which party is in office or what reforms are instituted. This expansion of costs has many drivers, most of which result from the system’s perverse incentives for fraud, overbilling, marginal treatments and defensive medicine.Technological and medical advances offer more options for treatment, and can push costs up–but advances can just as readily push costs down, too. 6. America’s inability and/or unwillingness to have an adult discussion over end-of-life care for the elderly. Other advanced nations do not spend gargantuan sums on the elderly and end-of-life care. Please look carefully at this chart. 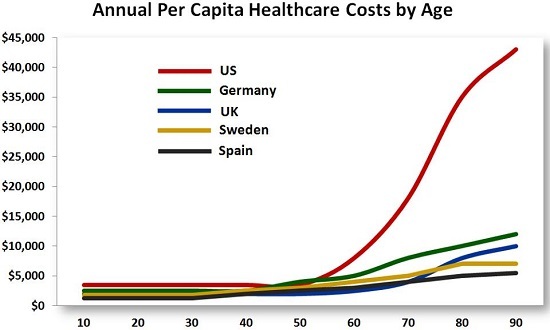 No one with any knowledge of life in Sweden or Germany would declare their care of the elderly barbarous, yet somehow Sweden’s cost of care actually declines as the elderly approach the end of their lives, while the cost of care for the elderly skyrockets in the U.S. It is clear that per-person spending among the highest users is substantial and represents a natural starting point when thinking about how to curb health care spending. For instance, the average expenditure for each of the approximately 3 million people comprising the top 1 percent of spenders was more than $90,000 in 2009 (Figure 2). The top 5 percent of spenders were responsible for $623 billion in expenditures or nearly $41,000 per patient. In contrast, mean annual spending for the bottom half of distribution was just $236 per person, totaling only $36 billion for the entire group of more than 150 million people. The majority of U.S. healthcare spending is not productive; it is a drag on productivity. Subtract the fraud, overbilling, defensive medicine, marginal/ineffective overtreatments and tests and the extreme concentration of costs in 5% of the populace, and we’d have a system that we could afford, i.e. one that cost less than 10% of GDP, in line with our advanced-economy competitors. As it stands now, U.S. healthcare will bankrupt the nation and doom it to permanent stagnation and recession. It’s our choice: live with a bankrupt system built almost entirely of perverse incentives, or begin an adult discussion about a system that delivers responsible care to the elderly in line with other advanced nations, but at a fraction of the current cost. Brexit: Biopharma Analysts Need to be Geopolitical Experts Too Now?